Location: Alleuze, in the Cantal departement of France (Auvergne Region). Ownership / Access: Private property but open to visits. Notes: Château d'Alleuze is a former castle of the twelfth century, rebuilt and restored several times and which dates back to the twelfth century, which stands on the town of Alleuze in the Cantal department in the Auvergne region. This building is now in ruins and maintained in this state. He is accompanied by St. Illide chapel, rebuilt in the fifteenth century. The remains of the castle are the subject of a registration as a historic monument by decree of 9 March 1927. Owned by the twelfth century Beraud VIII Mercœur, constable of Auvergne, lord of Aubijoux and Alleuze. He was then the possession of the bishops of Clermont. It was one of the outposts of the citadel of Saint-Flour. During the Hundred Years War, Bernard de Garlan (English party) seizes. It spreads terror throughout the region and it is only the price of gold that we manage to dislodge. 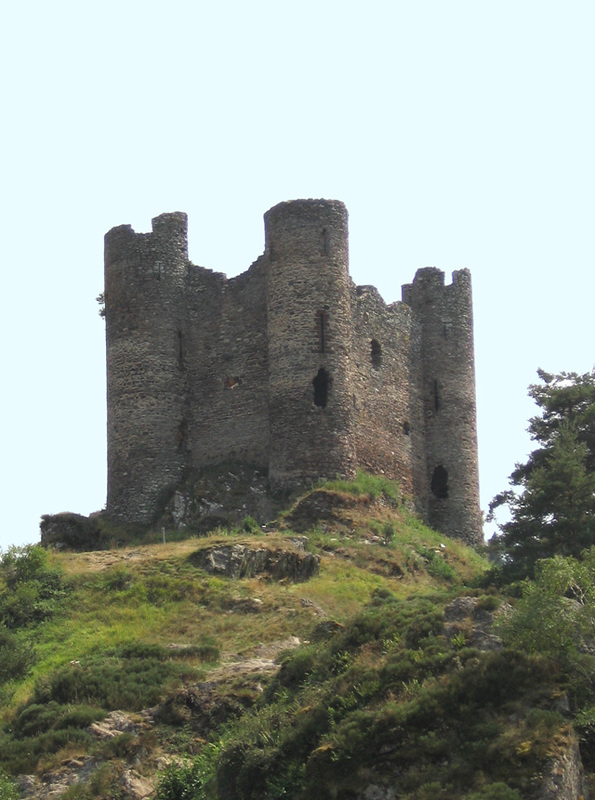 To prevent Garlan have successors, the people of Saint-Flour in 1405 the castle burned. Monseigneur de la Tour, owner of the castle, very unhappy with these depredations, forced the Sanflorains rebuild. The Huguenots took it in 1575. The towers were used as jails by the bishops of Clermont. Château d'Alleuze castle is a characteristic map of the buildings built in the fourteenth century: a square, flanked by round towers at the corners. After its destruction in 1405 by Sanflorains, it was rebuilt in 1411 on the same plane. The castle appears on one of the planes of La Grande Vadrouille, when pursuing the Louis de Funes truck by German bikers, and also in The Alien Didier Bourdon.